Our EDR solution enables security analysts to proactively identify suspicious activities, provide a robust anomaly detection and endpoint visibility. When it comes to security, information is key and real-time information is critical for protecting your network. Remove security blind spots on your network by identifying high-risk vulnerabilities and exploits using natural language queries and customizable content. TYCHON, with McAfee’s Security Suite®, offers a comprehensive and integrated EDR solution with automation which takes your security to the next level. Remediate findings after asking the question. Found an unwanted process? Kill the process from within the question results. Through TYCHON’s RapidQuery a list of frequently asked questions can be easily executed to obtain a wide range of information. 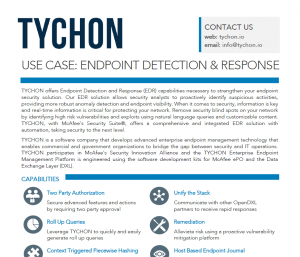 Leveraging DXL, TYCHON communicates with other OpenDXL partners and allows for autonomous, rapid, and robust responses taking security operations to the next level. Detected threats can trigger automatic endpoint isolation, remediation, and user notification.